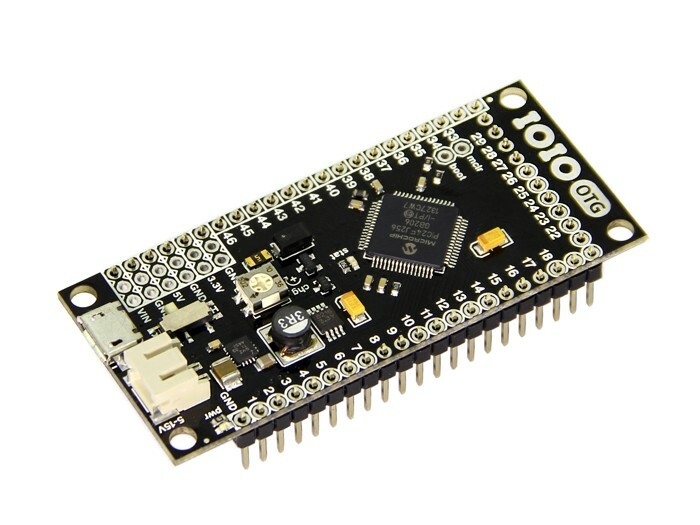 The IOIO-OTG is a board which allows you to quickly and easily interface electronic circuits to an Android device or a PC: Connect the IOIO-OTG to the Android / PC using USB or Bluetooth. Power the IOIO-OTG (not required if operating in USB device mode, see below). 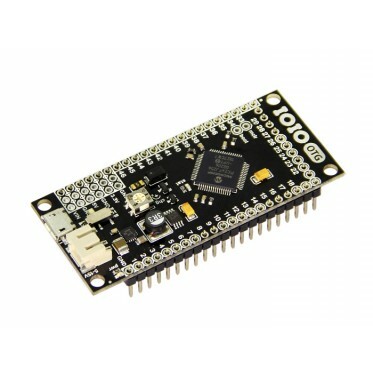 Connect your circuits to any of the 46 I/O pins available on the IOIO-OTG. 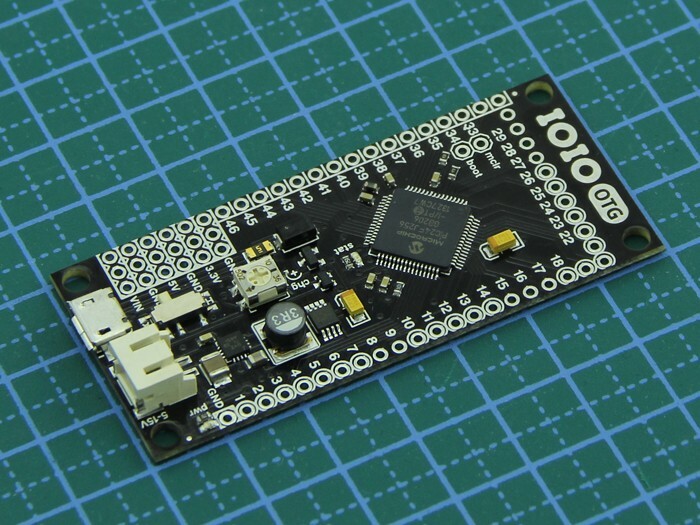 You can power your circuits off of the IOIO-OTG too. Write a Java program to control the I/O pins, using a high-level API using the provided libraries. Technical Details Power Supply The IOIO-OTG can be powered in one of two ways: By supplying 5V-15V to its JST connector. Do not exceed 10V if using long wires between the power supply and the IOIO-OTG or you might damage the board. 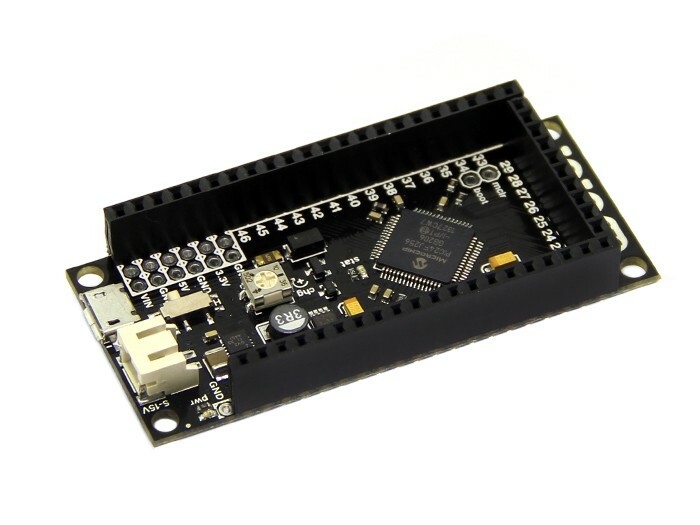 The IOIO-OTG has an on-board 5V switching regulator, capable of sourcing up to 3A continuous. Your power supply has to be capable of sourcing sufficient current for your application. 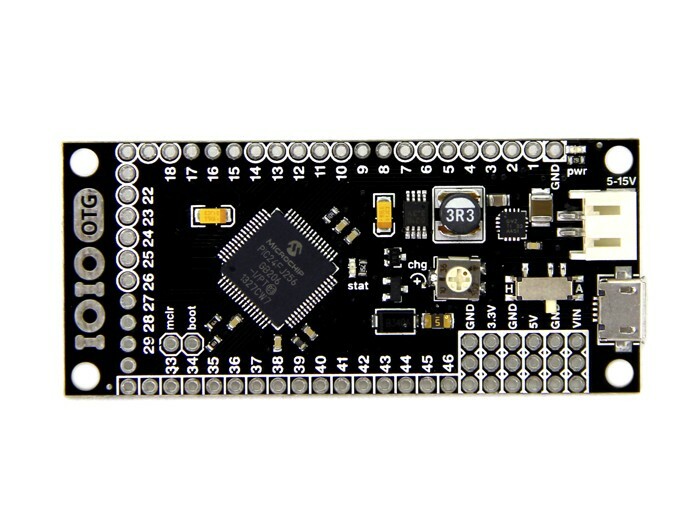 Keep in mind that when connected to an Android device with the IOIO acting as a USB host, the IOIO will charge the Android, which may consume up to 500mA @ 5V. You can limit the charging current somewhat using the trim-pot marked “CHG” on the board. Over USB, whenever the IOIO is acting as a USB device. When working in this mode, make sure that the total current draw of your circuit does not exceed 500mA. Otherwise, it is perfectly OK to connect an external power supply, as described above, in addition to acting as a USB device. In this mode, the IOIO will only draw current from the external supply. Once powered, you can draw up to 3A from the 5V pins (given an adequate power supply) and up to 100mA from the 3.3V pins to power your circuit. Connecting to Android / PC All the following connection modes are supported: Connecting to Android, IOIO acting as a USB host. Connect the included USB-OTG cable to the IOIO, then use a standard USB cable to connect the Android device. For working with older Android devices (down to Android V1.5!